BeiLi is a leading manufacturer of 3,4-ethylenedioxythiophene(EDOT) 126213-50-1 which has the patented technology for producing high quality EDOT. 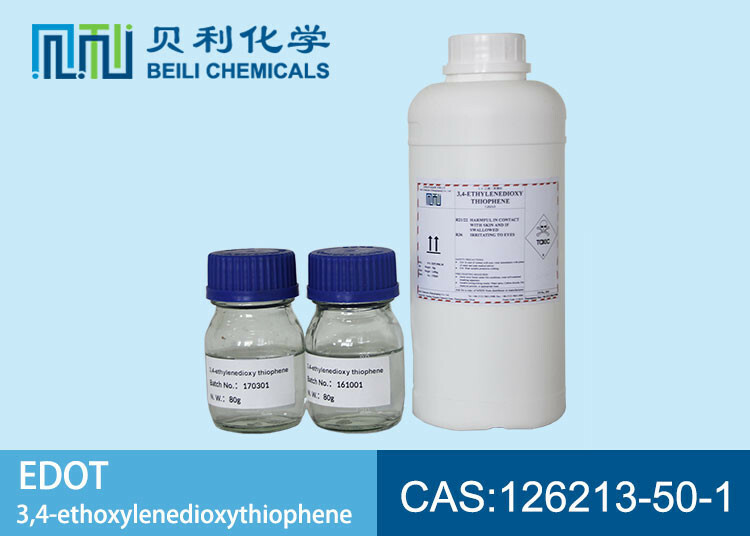 BeiLi Brand CAS 126213-50-1 99.9% 3,4-Ethylenedioxythiophene EDOT is using technology patents developed by the company with reliable quality assurance.Our patented technology makes it easy to obtain the target-3,4-Ethylenedioxythiophene EDOT with a short route, high product yield, mild reaction conditions, recyclable materials such as raw materials and solvents, which greatly reduces production costs, reducing the emission of waste, less pollution, with good prospects for industrial applications. The electrolytic capacitor using PEDT as the negative pole is called solid conductive polymer capacitor. Its conductivity is 100S / CM, which is 100 times of TCNQ salt, 10,000 times of electrolyte.The security of solid conductive polymer capacitor is better, when it is in the high Temperature, the electrolyte is just melting but can not explode. Compared with the traditional manganese dioxide solid electrolytic transistor electrode, the solid electrolytic capacitor electrode made by PEDT has the following characteristic. PEDT as a new type of storage capacitor materials. The present experimental data indicate that the capacity of super capacitor using PEDT as electrode can achieve 3000 F. Recent research has concentrated on improving the polymer discharge performance, cycle life and thermal stability and so on. Organic electroluminescence (OEL) display technology is a quite hot topic in recent years. PEDT can be as the hole injection layer of PLED, also can replace indium oxide or Tin oxide(ITO) conductive layer, therefore PEDT is the most important polymers of PLED technology in the future. Moreover, as the fine characteristics of PEDT, it has broad applying prospects in Via PCB coating, sensors, rechargeable batteries, photodiode, corrosion protection. PEDT and its derivatives are kinds of the polymer with good conductivity and high stability, It has been successfully applied in solid capacitors, antistatic coatings, organic electroluminescence and many other electronics industry area in recent years. It brought to the rapid development of conductive polymer, representing the development trend of conductive polymers. It has become the most important material of electronics and information industry now. 1,5,10,50kgs/iron drum with plastic lining. BeiLi is a leading manufacturer of 3,4-ethylenedioxythiophene(EDOT) 126213-50-1 which has the patented technology for producing high quality EDOT. We can provide our customers with quality 3,4-ethylenedioxythiophene(EDOT) 126213-50-1. Regarding purity and the quantity you require, these two factors may affect the price. If you require any further information about 3,4-ethylenedioxythiophene(EDOT) 126213-50-1, please do not hesitate to contact our experienced staff.